"Scallops coated with my own special seasoning and fried to a golden brown in butter." Combine the bread crumbs, Parmesan cheese, and blackened seasoning in a large, resealable plastic bag. Dip the scallops into a bowl of heavy cream to coat. Place the scallops one at a time into the plastic bag; shake to coat with the seasoning mixture. Place the breaded scallop on a plate and repeat with the remaining scallops. Pan fry the scallops until golden brown, about 2 minutes on each side. Good recipe, but breading falls apart in pan. Maybe if scallops are doubled dipped, the breading would stay on. Nice twist for a scallop. Pretty good. 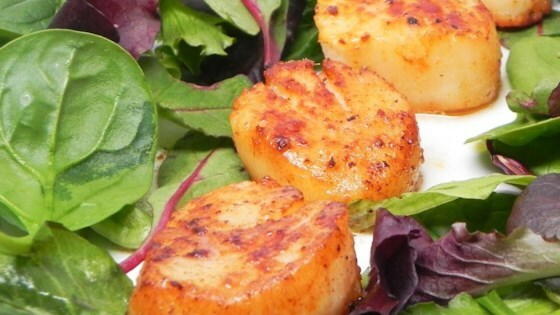 Definitely something different to make with scallops & very easy.